Top imam in Islamic group which administers the Temple Mount arrested over riots, violation of police orders - only to be freed hours later. Israeli police arrested the top Islamic official at the religious trust charged with administering the Temple Mount on Sunday – only to release him hours later. 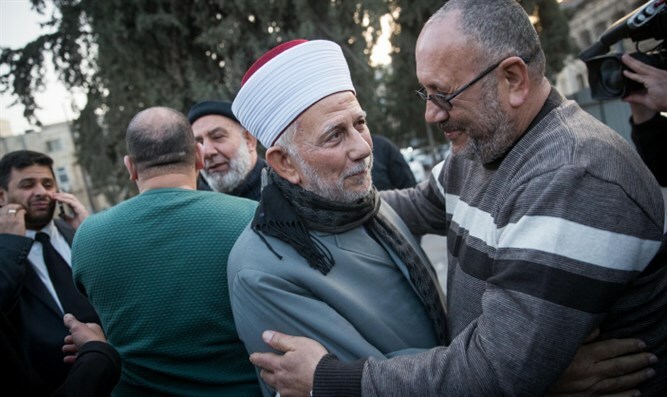 Sheikh Abdel-Azeem Salhab, the top imam at the Temple Mount Waqf, was arrested Sunday following Arab riots on the sensitive Jerusalem holy site, after the Waqf violated a police order and opened a closed off building at the side of the Mount. The Waqf, a Jordanian-based Islamic trust, administers the Temple Mount. Access to the holy site is strictly limited for non-Muslims, who are permitted visitation rights, but are barred from worshipping on the Mount. Last week, Muslim worshippers on the Mount attempted to force their way into the Golden Gate and the adjoining space, which have been closed by Israeli authorities since 2003, after the area was used for terrorist activities during the Second Intifada. When police intervened last week, riots broke out on the Temple Mount, leading to multiple arrests. The clashes worsened during the week, culminating in mass riots Thursday, with more than 60 rioters arrested. On Friday, rioters forced their way into the Golden Gate, after police officers were instructed to contain the rioters, but not to remove them from the Golden Gate. In response to the riots and the violation of the closure order for the Golden Gate, Israeli police arrested Sheikh Salhab and, according to the Palestinian Authority outlet WAFA, Salhab’s deputy, Najih Bakira. The two men were later released, but have been barred from visiting the Temple Mount for the next seven days, their attorney claimed. The Jordanian government filed an official protest with Israel over the arrests, which Jordan’s religious minister said were tantamount to “playing with fire,” AFP reported.